chateau savoie: To press or not to press. I was really jazzed when I saw this article today. 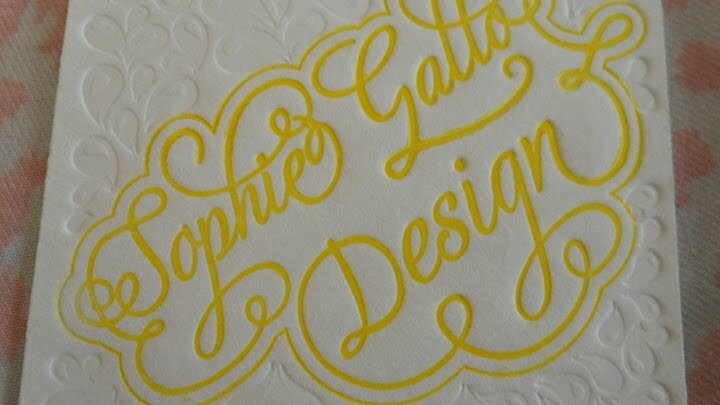 Sophie Gallo letterpressed her business cards at home using an etching press. Having done enough etching in my past to know how it all goes, it started the wheels ticking. I've been dying to letterpress my stationery for Etsy but I've kind of assumed I would have to either apprentice at one of the 2 letterpress shops I've managed to find over here in the NL [doesn't seem nearly as popular here as it is in the US] or just pay one of them to print the cards and hope that someone buys them. Seeing Sophie ink 'em up and roll 'em out with rather stunning results from home got me googling. So I found this interesting product here. It's a DIY letterpress machine. There's a "review" of it on DIY bride here. But it's more of an overview complete with a little video than it is a review of the actual product. And of course at Briarpress.org [a type purist's dream] all the letterpress junkies get on their high horses and bemoan the fall of letterpress and the over-accessibility of this product, allowing housewives to think they are letterpress printers too. Poohpooh to them, I say. As a designer, I completely understand that you have a job that everyone thinks they can do too. Them's the breaks. Good design can only come of hard work, careful consideration, and a wealth of knowledge and knowhow. Just because someone has a mac and a printer, I don't feel threatened and neither should these printers/craftsmen/artisans. Did Gocco destroy the screenprinting industry? I think not. So here's the big question. Has anyone actually tried one of these little DIY letterpress babies? The L Letterpress Machine to be exact. Are you morally opposed to these machines too? Do any of you letterpress? How did you start? Any recommendations for an aspiring letterpresser? I would love to see your thoughts and comments. Do me a solid and throw some thoughts my way. cheers. Sorry, I can't help you out with a review! I'm not a lettepress maker but I certainly appreciate it. I'm surprised to hear it is not as popular in the Netherlands. I'm thinking maybe the lack of popularity could be a good thing. Maybe a little more letterpress is just what this place needs.